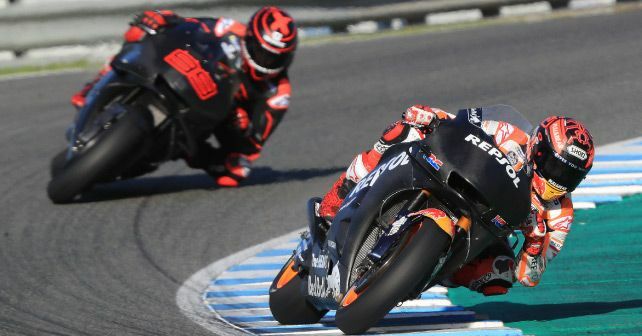 Lorenzo got his first taste of the Honda RC213V at Valencia and Jerez tests. So, can he beat Marquez on equal machinery? There’s a lot to talk about the recently concluded winter tests that took place in Valencia and Jerez. However, if there was one particular thing that everyone wanted to know after the testing sessions were done, it was this – how fast did Jorge Lorenzo go on the Honda? At Valencia, Lorenzo hopped on the Honda RC213V for the first time. He finished the two-day test in 12th, whereas Marquez was 3rd. Lorenzo’s best lap time was 0.827s slower than Yamaha’s Maverick Vinales, who topped the timesheets at Valencia test. Not a bad start, considering he was recovering from a nasty wrist injury. Plus, the weather at Valencia was mostly damp and cold, so it wasn’t quite representative of actual race conditions. The Jerez test, though, was more indicative of what to expect from the upcoming season. And that’s to say that Lorenzo is going to be up there to win races, if not championship. He finished the test as fourth fastest rider on the final day of testing and was just 0.135s slower than his team-mate, who was second in the combined times. Now, while tests are just tests and one-off lap times don’t tell the whole story, it’s clear that Lorenzo’s smooth riding style will work on the Honda, and he’ll get up to speed more quickly than many cynics had guessed earlier. He looked comfortable riding the RC213V, and then Honda is doing everything in their capacity to make him 100 per cent comfortable. In fact, they got him a specially modified fuel tank, just like the one he used on the Ducati, so as to grip the bike better. Will Lorenzo have the measure of Marquez? Will he be a championship contender? Well, it’s early days, but it sure is going to be an interesting duel between the two. Marquez definitely has more experience riding the Honda, but he’s going to have a challenging season ahead. He just had had a shoulder surgery and is recovering from it, the Ducatis are getting faster, Yamaha is reviving and then he’d also be wary of the fact that his new teammate is the only rider who denied him a world championship (2015) in the premier class. Marquez has shown that he’s the absolute best rider out there, but next 2019 is going to get even tougher, especially with Lorenzo around. Honestly, we can’t really wait for the fireworks to begin.